Fashion you can purchase, but the style you own. The key to fashion is learning who you are, which takes time. There's no how-to roadmap to fashion. It's about self-appearance and, above all, stance. Your dress makes represents you in the public. So, be careful in the selection of dresses. Felicity Smoak Arrow S5E18 Leather Blue Jacket is one of the most favorite leather jackets by customers. This jacket is inspired by the most favorite TV serial “The Arrow”. This serial includes the factual story of how Canada built and shattered the world's most highly developed fighter plane back in the 1950s. Felicity Smoak Arrow S5E18 Leather Blue Jacket is made up PU leather with warmer viscose lining inside the jacket. It has side zipper style front closure. It has a round neckline style and full-length open hem cuffs style with a doubled material. Its blue eye-catching color will make you superior in any gathering.Stephen Amell Green Arrow Season 4 Hooded Leather Jacket is inspired by the renowned TV arrangement the green arrow season 4. Stephen Amell has played the main role as Green Arrow otherwise called Oliver Queen. He used to wear this beautiful jacket. 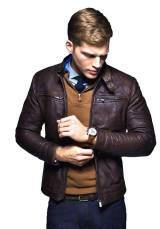 This jacket is made up of PU leather material. It has front zip closure and hood style which makes it stylish and unique. It has viscose lining inside the jacket. This Green Arrow PU Leather Jacket has two takes which set inside the sticky covering inside.Red Arrow Roy Harper Jacket is inspired by the TV show Red Arrow where Roy Harper was one of the top characters in this Series which are represented by Colton Haynes. William jacket brings you the same attire which is made up PU leather with viscose lining inside. It has padding on shoulders. It has high detailing with thread on chest and sleeves. It has full front zip fastening attached hood. Overall this Red Arrow Roy Harper Jacket is the best jacket that must be added into your wardrobe.